A win for J14s at end of the season. Smiles all round. Well done! 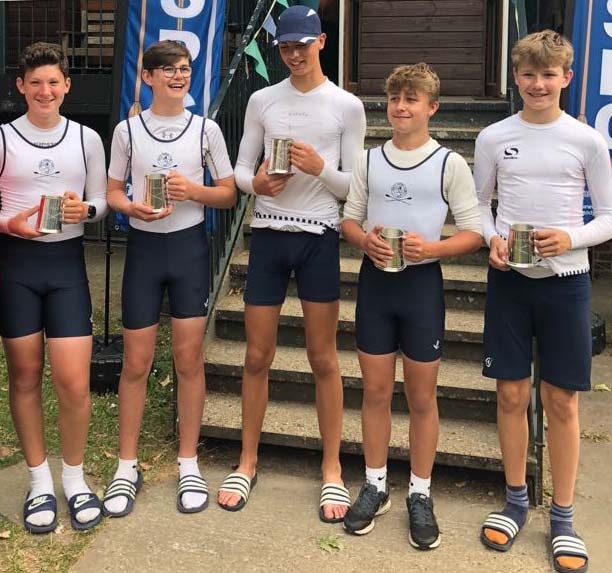 The J14 boys’ racing season has come to an end with Egham regatta. 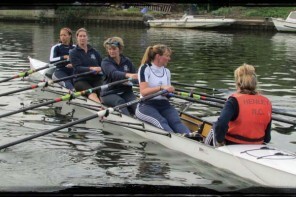 They have struggled with little success this year, but finally managed a precious win in the J14B Coxed Quads. The crew of James Oldham, David Wallace, Elio Dal Lago and Zach Charles with Joe Hart coxing managed to overcome a field of 6 other crews. They won their final by a well-deserved 2 lengths. Earlier in the day Jamie Maclellan raced hard in the J14 single sculls but finally succumbed to his nemesis from Reading in another close race. Soren O’Connor (J15) and Ethan Chatfield (J16), both competed in the very popular single sculls events. Both reached their respective finals but were unable to convert that into a victory. The J14 girls have had a successful season and in the double sculls felt confident enough to race up an age group. 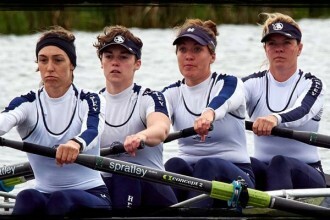 Natalie Schoenmakers and Laoise O’Donohue had to race the 650m coarse four times beating ten other crews in the process eventually winning the final by 1 length. 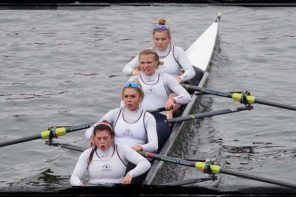 The ‘A’ quad of Charlotte Beadmore, Josie Sawbridge, Mia Roullier, Bea Bethell and cox Daisy Rolstone, had an easier time of two races to win their final.